Wilton Baking Basics 3-pc Cookie Sheets Just $7.18! Down From $18! You are here: Home / Great Deals / Wilton Baking Basics 3-pc Cookie Sheets Just $7.18! Down From $18! Sears has these Wilton Baking Basics 3-pc Cookie Sheets for just $17.99 and Shop Your Members can get back $10.18 in points, making it $7.18! 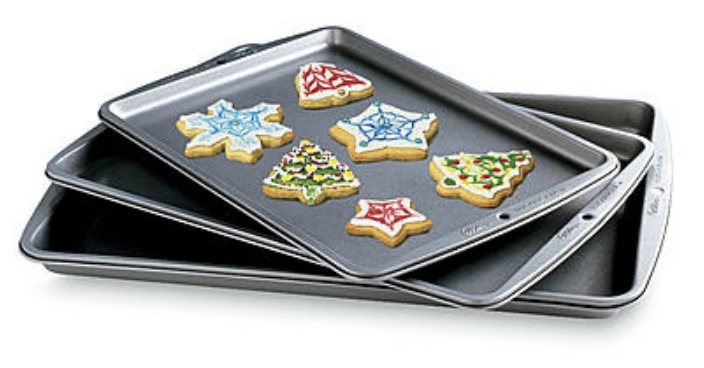 You’re sure to be impressed with the versatility of Baking Basics 3-pc cookie sheets from Wilton. Not just for cookies, these varying sized sheets are an excellent choice for cooking pizza, french fries and so much more. Non-stick for excellent food release, these sheets are durable, functional, lightweight and space-saving.